on July 18, 2017, 6:34 p.m.
Once seen as a sign of deviance or criminality, tattoos have taken on a new lease of life in recent years and moved into the mainstream. But that hasn’t made their popularity universal and new research reveals that tattoos continue to divide opinion. Indeed, YouGov’s poll of 1,000 Australians suggests the decision to get inked is not just skin-deep. Though 43% of Aussies have a positive view of tattoos, 48% of people see them negatively. Age is a significant factor in shaping attitudes; while respondents under 35s are more likely to have either a very positive or fairly positive view, those 35 and older are more likely to view tattoos as either very or fairly negative. Yet young people are not necessarily the most likely to have tattoos. In fact, tattoos are most prevalent among those aged between 35 and 44 in Australia, nearly a third of whom (30%) have at least one tattoo. In total just over a fifth of the population (22%) have been tattooed. Body art is slightly more popular among women; a quarter (25%) of women have them compared to 19% of men. Some worry that their tattoos aren’t always seen as an asset in the workplace, particularly women, who are nearly four times more likely to believe having a tattoo has damaged their career prospects. Across the overall population, 8% of those polled believe having a tattoo has damaged their career prospects, but this rises to 11% among women. It is only 3% among men. There is a similar divide between urban and rural dwellers; those in urban areas are far more likely (11%) to believe that having a tattoo damages career prospects than those in regional areas (4%). Yet Aussies don’t seem to regret their choices. Despite the boon of tattoo removal specialists, just 13% of respondents have considered getting their tattoo(s) removed. All in all, nearly three-quarters of those with tattoos (74%) are pleased to have them. Across all demographics, the most popular spots to have tattooed are the arm(s) (54%), back (32%) and shoulder (30%). 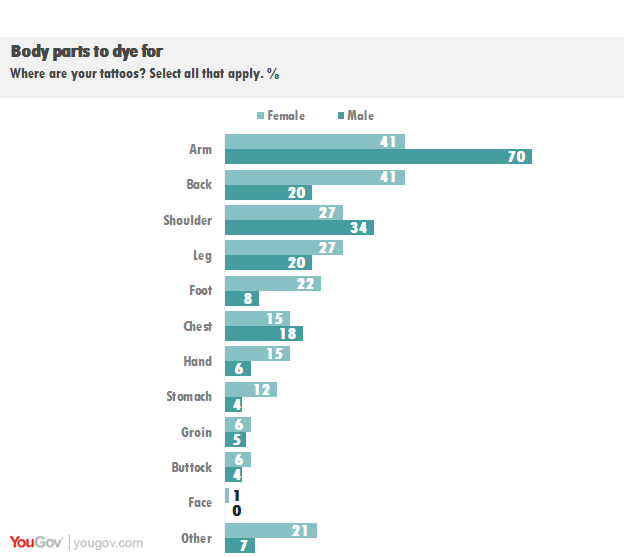 But tastes differ between genders over the most popular body parts to get inked. Twice as many women (41%) have tattoos on their back compared with men (20%), whereas men are far more likely to opt for tattoos on their arm. 70% of men with tattoos have at least one on their arm(s); significantly more than the 41% of women who do.